A few weeks ago, a beautiful early nineteenth-century frame arrived at Capital Restoration. It had survived the centuries in near perfect condition until a disastrous slip crushed one of the ornately carved corners. Carving high-quality frames at this period involved two different specialized carvers. A wood carver carved the frame in wood and then it was coated with many layers of gesso to provide a perfectly smooth surface for the gilding. After the gesso had dried, a second specialist carver re-cut all of the tiny details into the gesso itself. Then the gilder applied oil gilding to the re-carved gesso. Shortly after this frame was made, mass production methods were introduced, where plaster ornament was cast in molds and applied to wood substrates and the hand carving of ornate frames became practically a lost art. Antique frame after carving and gilding a broken corner which was built up of compound. In the repair of this frame, new gesso could not be used to rebuild the broken corner as it is water based and it would soften the surrounding original gesso. Instead, a modern compound was utilized and, when this had hardened, it was carved to shape with miniature carving tools and gilded to match. The appearance of decades of grime and atmospheric pollutants was also simulated. The result is an invisible repair and the frame is now ready to be displayed again. 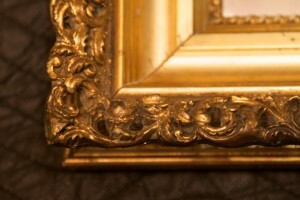 Capital Restoration, in Raleigh North Carolina, offers a full range of antique and vintage frame restoration services including casting and carving missing components, oil and water gilding and gold leaf. Loose and cracking decorative elements can be secured and loose joints in the wood frame repaired. Repairs to other gilded decorative art objects and furniture are also undertaken. All repairs are carried out in-house by owner John Allen. Please contact him through the website for a free assessment and treatment proposal.